Assigning the rel="nofollow" attribute to a link informs search engines that the link is commercial in nature, or that it’s a link you don’t endorse. Links that have the the rel="nofollow" attribute are often called nofollow links. The concept behind nofollow links came about in 2005, as a way of discouraging comment spam in blogs. You might already know this if you’re familiar with SEO: One of the factors search engines take into account when ranking a website is the number of other websites linking to it (referred to as the site’s inbound links). If there are many links from other sites pointing to your site, and those other sites are reputable, then there’s a good chance your site is also reputable. To artificially boost their clients’ search engine rankings, spammers will try to place as many links as they can on other websites. An easy target for spammers are the “comments” sections of reputable blogs. To help address the spam issue, the rel="nofollow" attribute was introduced. The thinking went like this: If comment spammers didn’t get credit for their nofollow links, then they’d be less likely to waste their time posting those links on blogs. The rel="nofollow" attribute started off as a microformat. However, the HTML attribute is now in the latest W3C HTML specification, in section 4.8.4.7 Link type “nofollow”. 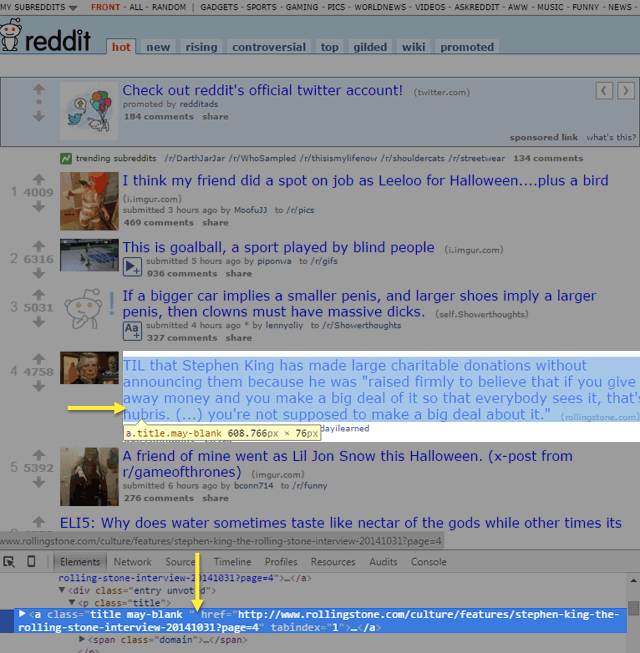 So, When Should You Use rel=”nofollow”? Let’s talk about these two cases. A typical example of a link you can’t endorse is one that was placed on your site by someone else. That’s why, by default, WordPress (1.5 and above) automatically sets the rel="nofollow" attribute on user-generated links in the “comments” sections of WordPress-powered sites. Wikipedia uses the rel="nofollow" attribute on all external links. Wikipedia can be edited by anyone. And because of the sheer volume of content on the site, it’s not practical for Wikipedia to verify, review, and endorse each and every external link posted on their site. So Wikipedia decided to categorically assign the rel="nofollow" attribute on all external links, much like how WordPress categorically assigns the attribute on all external links it finds in the “comments” section. On Wikipedia, notice how an external link that goes to w3.org — which you and I know is a pretty reputable site — is a nofollow link. 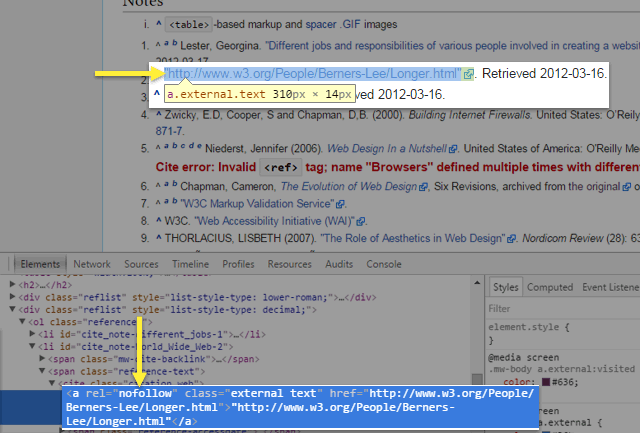 With Chrome DevTools, we can see that external links in Wikipedia have rel="nofollow" attributes. On Reddit, new link submissions are nofollow. What’s interesting with Reddit’s implementation is that when an external link has been voted to the front page of the site, its rel="nofollow" attribute is removed. 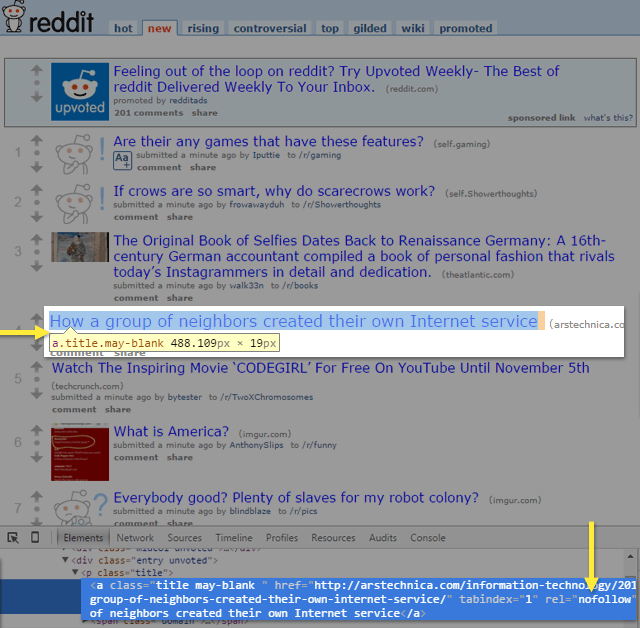 Reddit’s system of assigning rel="nofollow" attributes is clever because it’s democratic. Reddit makes the hypothesis that if a submitted link gets the required votes needed to propel itself to the site’s front page, then it must mean enough people have reviewed the trustworthiness of the link, and thus the link’s rel="nofollow" attribute can be safely dropped. When a link exists on your site primarily for profit, it should be assigned a rel="nofollow" attribute. Simply put: If you publish paid advertisements on your site — banner ads, text links, sponsored content, affiliate links, etc. — the links going to your advertisers’ sites should be nofollow. This is one way to discourage any site from trying to buy its way into better search rankings by paying other sites for links. The rel="nofollow" attribute benefits third-party services most. Search engines, for example, can use the information we give them about links on our site as a clue that certain links might be low-quality, or commercial in nature, or both. They can then use this knowledge to improve the quality of their search results for their users. By disclosing which links on our site have been paid for and which ones haven’t been reviewed, we can reduce the chances of search engines penalizing our site for publishing low-quality external links. It’s reasonable to assume that by diligently assigning the rel="nofollow" attribute on our unverified, untrusted, and paid links we can improve our website’s SEO, and our website’s trustworthiness as a source of quality content. Video: Can nofollow links hurt my site’s ranking? What Potential Impact Can HTML5 Have on SEO?